The new floating boardwalk in Florence, Oregon, runs along the building supports in Old Town. It was the perfect vantage point to see under the old boardwalk into the watery rooms as the late afternoon sun found openings to blaze through. 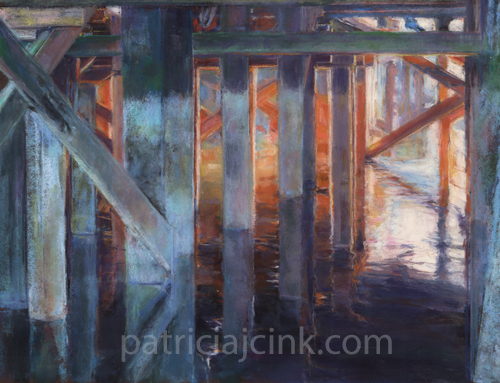 The water, wood and light combined for an abstract and musical effect. This painting is currently in the “Music as the Muse” show at the Southern Coos Hospital in Bandon, Oregon. The show runs until September 26, 2015. The artist’s reception is July 26, 1:00-3:00 pm, at the hospital.